The Cheat Canyon stretches for 3 miles from Albright, WV to Jenkinsburg (Big) Bridge. This 13-mile section of river contains over 30 rapids rated Class III to Class V surrounded by the beauty of a spectacular wilderness canyon. The Cheat Canyon trip departs directly from the Cheat River Outfitters Visitor Center in Albright , WV. The season for running the Canyon is Spring. The Canyon shows her stuff when heavy rains and snowmelt equal higher water levels. The Cheat Canyon runs primarily from April through mid-June, but we will run anytime we are experiencing good rainfall amounts. 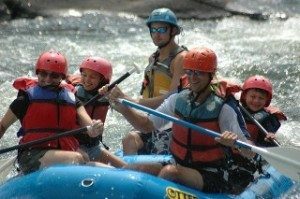 For a memorable Spring whitewater weekend, pair the Upper Yough and Cheat Canyon on consecutive days! Book my Canyon trip NOW. Not ready for the Upper Yough? Our sister company, Cheat River Outfitters, offers great family and introductory whitewater trips on the scenic Cheat Narrows. In the spring, when water levels tend to be higher, the Narrows is an exciting moderate river trip, providing great fun for nearly all ages and skill levels. The Narrows in the spring makes an excellent first time rafting experience and is perfect for anyone who wants to experience the thrills of the Cheat on a smaller scale. The half day Cheat Narrows trip winds up to 10 miles along scenic Rt. 72 just north of Cheat River Outfitters, Albright Visitors Center. Steady spring rain and snowmelt fills the Narrows with giant wave trains and Class II-IV rapids. If the weather is warm we can stop and enjoy getting wet at Jump Rock. The Narrows are a great whitewater trip for beginner and advanced paddlers alike. In the spring, the Narrows is ideal for scouting and youth groups and is suitable for ages 10 and up. In the summer, when water levels tend to be lower, the Cheat Narrows is a exciting and memorable whitewater experience and overall river day. The summer Narrows offer 7 miles of gorgeous Class II-III whitewater with crystal clear water, beautiful scenery and plenty of opportunities to get wet. The Narrows is a half day trip and we will match the boat size to the water level to give you the best ride for the day. Summertime Narrows can run in Duckies (one man rafts) up to 8-man rafts depending on water level. No matter what the water level, our excellent guides will show you a fabulous summer day on the Cheat Narrows. The Narrows is ideal for families with kids as young as 6 as well as Scouts, Youth Groups, and anyone wanting a fun day on the river. This trip runs twice a day at 9 a.m. (with lunch included) and 2:30 p.m. (with a hearty snack). Book my Narrows trip NOW.